Walters, who did not join up with the squad until Wednesday as a possible deadline day move away from Stoke failed to materialise, stabbed home his seventh and arguably most important goal for his country after Jeff Hendrick’s stunning run and cross 69 minutes into a tie which proved far too tricky for comfort. A 1-0 victory at the Aviva Stadium, coupled with Scotland’s 3-2 home defeat by Germany, leaves Martin O’Neill’s men four points clear of their neighbours in the race for third spot in Group D and a crack at the play-offs with two games remaining. 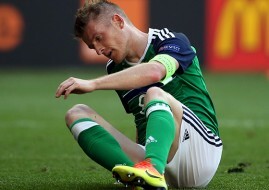 Their task remains difficult with Germany heading for Dublin before Ireland fly to Poland next month, but they have at least given themselves a chance – although midfielders Glenn Whelan and James McClean will sit out the first game through suspension. Having been handed a lifeline by the Scots’ defeat in Tbilisi and their expected victory over Gibraltar on Friday evening, Ireland ran out knowing there was much hard work still to be done, but equally aware that their fate remained in their own hands – albeit with top two Poland and Germany to come. O’Neill had made a point of trying to dampen expectation after a bullish optimism emerged in the country over the weekend, and his caution proved well-founded as his side turned in an insipid opening 45 minutes and the Georgians demonstrated an admirable new-found confidence. It was they who played much of what football was on offer during the opening half – and there was not a great deal – as the home side were largely becalmed. The visitors’ defence proved more than equal to Ireland’s often direct approach with Wes Hoolahan looking the only man likely to unlock it, although even then, all too infrequently. For their part, Ireland mustered the two best chances of the half with skipper Robbie Keane firing high over after controlling Hoolahan’s seventh-minute cross on his chest and full-back Seamus Coleman forcing a flying 37th-minute save from keeper Nukri Revishvili with a well-struck volley. O’Neill made a big decision at the break when he withdrew Keane, who went into the game looking for a 68th senior international goal, and replaced him with Shane Long. Revishvili was in the right-place to field Whelan’s deflected strike from distance after Robbie Brady had drilled a free-kick wastefully into the defensive wall, and he managed to repel Hendrick’s deflected effort as the Republic finally built up a head of steam. Long might have made it 2-0 after substitute McClean had run on to Whelan’s pass and drilled the ball across goal, but he completely miskicked to let Georgia off the hook.